This is turning out to be a big year for expanding health coverage in states across the country. The Virginia Legislature recently voted to accept Medicaid expansion funding from the federal government to cover uninsured low-wage workers. A judge just ordered Maine to implement the Medicaid expansion plan approved by the state's voters. Utah is putting Medicaid expansion on the ballot this November. Idaho and Nebraska are on the verge of putting expansion on the ballot. We're excited and inspired to see these states moving forward to address the challenges created by leaving so many people uninsured. Here in Texas, it's now more important than ever for state leaders to come up with a plan to reduce the state's high uninsured rate. In recent years, compared to the rest of the country, Texas has had the highest uninsured rate and highest number of insured people. 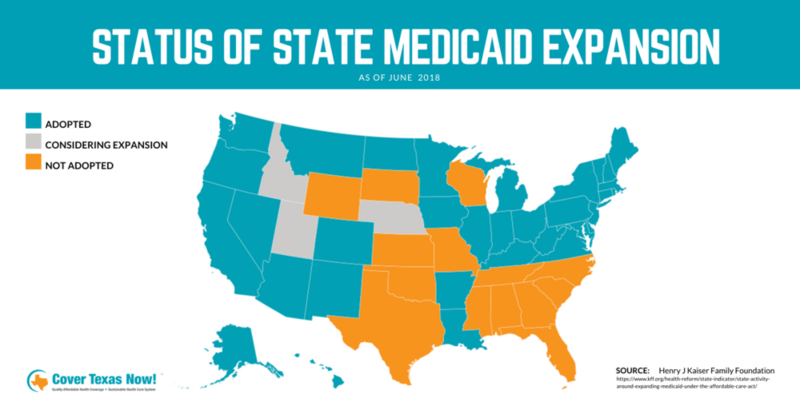 We also have a large coverage gap created by state leaders' decision to turn down Medicaid expansion funding thus far. And now, the number of uninsured Americans is on the rise across the country and in states like Texas. Make no mistake: the high uninsured rate in Texas contributes to real problems in our state. For one thing, leaving so many Texans uninsured creates real financial challenges. We all pay higher property taxes for local hospitals and health problems because so many Texans don't have access to an affordable health insurance option. And many Texans get stuck with huge medical bills, leaving them with medical debt that sometimes pushes families into bankruptcy. Of course, the high uninsured rate in Texas also contributes to numerous health problems. Texas parents, Texas workers, and Texas kids aren't as healthy as they could be. Without better access to insurance, it's harder to address challenges that state leaders have declared priorities including mental health; substance use disorder and the link to child neglect and removals by CPS; and maternal mortality and healthy pregnancies. Some Texans pay a particularly high price for the high uninsured rate. Rural communities are seeing hospital close down. Babies are not as healthy as they would be if their mothers had better access to health insurance. Texans working in construction, sales, child care, and other low-wage jobs are stuck without a viable insurance option. As Texas leaders prepare for the 2019 legislative session, we will encourage them to follow in the footsteps of other states and develop a plan to address our high uninsured rate.